Why was the position not closed even when the price was on the chart? Remember that there are two prices in the market: the price of sellers (ask) and the price of buyers (bid). A sell order is opened at the bid price, and is closed at the ask price. A buy order is opened at the ask price, and is closed at the bid price. For your SELL order, the stop-loss order is set at the price of 1.2970. The price in the chart reached 1.2968, but the order was closed by stop-loss price. In this case, 1.2968 is the bid price, and given the spread of 2 points, the ask price was 1.2970 (i.e. ask = bid + spread = 1.2968 +0.0002 = 1.2970). If trader’s funds fall below the required reserve funds, the broker has the right to close a part of loss-making positions at the current market price. Funds = Account balance + Results of opened transactions. Learn more about reserve requirements for each type of account in the section "Trading conditions / Types of accounts". To open a position in a terminal window, right-click the selected tool and in the window which appears, choose "New order". After this you should set the parameters for the order and open the position by pressing the "Buy / Sell". Why was the order not executed at the declared price? Buy Stop, Sell Stop, and Stop Loss orders are executed at the current price at the time of order processing. Buy Limit, Sell Limit, and Take Profit orders are executed at the price of the order. The leverage is a ratio between the trader’s own funds and borrowed funds, which a trader borrows from his broker. 1:100 leverage means that for a transaction you must have a trading account with amount 100 times less than the sum of the transaction. Example: a trader chooses the 1:500 leverage and has 200 euros on his account. Leverage 1:500 allows him to buy a contract worth 100.000 euros. Lot is a unit of transactions in trades. How does the stop order work? The Stop order is a trigger, and when it is reached, a corresponding order is generated. When the Stop order is activated, the Market order is generated. When the Stop-Limit order is activated, the Limit order is generated. 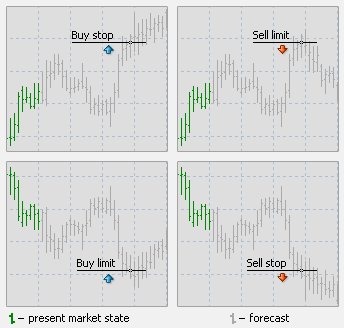 The Stop order price is a trigger, and when it is reached, a corresponding order (market or Limit) will be generated. How is profit in FOREX calculated? Let’s suppose you purchased 1 lot EURUSD at 1.2291 and later closed the position at 1.2391. When opening the position, you bought 100,000 EUR, which is 1,2291 * 100,000 = 122,910 in USD. Basically, you acquired an asset worth 122,910 USD. When closing the position, you sold this asset worth 100,000 EUR, which, due to the price change, cost 123,910 USD (1,2391 * 100,000). Your profit will be 123,910-122,910 = 1,000 USD. On Forex market, clients are charged with Rollover (Swap) charges for transiting the position over midnight. The amount of Swap depends on the difference between bank rates of the base currency and secondary currency in a currency pair. Swaps can have either positive or negative value. RoboMarkets swap rates are established in accordance with swap rates from our liquidity providers. Current swap rates for each trading instrument can be found in "Contract Specifications" section of our website. Why can I not sell at the weekend? The FOREX is not open on the weekend. How risky are operations in Forex? Trading currencies, stocks, and other investment products is of the market nature and always involves significant risks. Because of sharp market fluctuations, you may both make much of your investments and completely lose them. You may manage the risks (the ratio of possible financial losses to profits) by using the leverage value, and specific types of orders (Stop Loss / Take Profit) or other available tools. You should always remember that the higher the leverage and possible profit, the higher the risk level.